This year, the Tucker Center for Research on Girls & Women in Sport celebrates its 25th anniversary. Founded in 1993 by Dorothy McNeill Tucker, ’45, and kinesiology professor Mary Jo Kane, the Tucker Center leads interdisciplinary research efforts examining how exercise and sport and physical activity affect the lives of girls and women, their families, and communities. 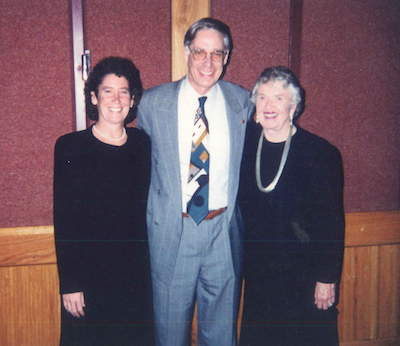 Tucker Center director Kane received her PhD from the University of Illinois, Urbana–Champaign, in 1985 and was awarded the Dorothy McNeill and Elbridge Ashcraft Tucker Chair for Women in Exercise Science and Sport in 1996. Nicole M. LaVoi, MA ’96, PhD ’02, joined the Tucker Center as co-director in 2005. Program associate Jonathan Sweet has been with the center since 1994. Over the past 25 years, the Tucker Center has also partnered with countless graduate students and visiting scholars who amplify the center’s mission and work. From their offices in Cooke Hall, Kane, LaVoi, and Sweet reflected on the Tucker Center’s legacy, accomplishments, and future. Can you describe the atmosphere around girls and women in sport at the time the Tucker Center was founded? Mary Jo Kane: It was 20 years after Title IX. After decades and decades of being told that girls aren’t interested in sports. We built them ballparks and playing fields and courts and ice rinks, and boy, did they come. The participation blew through the roof. That then led to the transition of [needing] a research center, housed in a major research university that took seriously the scientific study of what all this increased participation meant. It was an incredible moment. Nicole M. LaVoi: I was the first wave of Title IX [women] that got to play college sports. I loved sports and parlayed that into a career in coaching. But I did notice that there weren’t very many women coaching, and I would get a lot of what I would now label blatant sexism from my male colleagues. But that fueled my passion for coming back to the Tucker Center. Jonathan Sweet: Here, within University politics, I think [the Tucker Center] felt a little niche. Things have changed, through a lot of effort and awareness. But at the time, it definitely felt like this small little place at the end of the hall. The Tucker Center was the first of its kind. Why here? Why was the University of Minnesota the right place for it? MJK: The University of Minnesota has a reputation for being progressive. We also have a long and proud history of a very strong and powerful women’s athletics department. I’m not aware of any other university in the country that has more elite sports facilities for women’s sports named after women. The University gets it. We would have been hard pressed in other universities to get this level of support. The University of Minnesota was absolutely the right place to do it. NL: You’ve got a state that’s pretty progressive, you’ve got leadership in place that’s supportive of the Tucker Center, and then you had people who produced good work. And without those three things coming together, I don’t think we’d be where we are. MJK: People have tried to get these sorts of centers off the ground, and they haven’t lasted. And that’s because it’s really hard. What is remarkable about the Tucker Center is our staying power. Could each of you describe a favorite memory of the Tucker Center? MJK: An early memory was after Dr. Tucker agreed to fund the center. At the time, in 1993, it was the largest gift from an individual in the history of the college. That was a big deal. And we had a dinner at Eastcliff, the home of the president. I just remember sitting around the table at Eastcliff, thinking, “This is really going to happen.” It felt on the one hand quite wonderful—that this idea that I had culminated in this dinner being recognized by the president of the university—but also then a sense of enormous responsibility. JS: The very first grant that we ever wrote, we tried for a $10 million grant. We didn’t get it. But all of us pulled together, and we were here on a Saturday morning, and Mary Jo went and bought us burgers. And they were so bad. But the team atmosphere—everybody was there, was working hard. When [LaVoi] signed on and came back as the associate director, that was a pretty awesome thing that we all pulled off here—and the universe had a little bit to do with it too. NL: The first women coaches symposium that we ran. It was really a dream of mine. I wanted to do this for a long time. That was a really proud moment for me, and that’s still one of my favorite days of the year, every year. There are so many times when my door is open, and we’re all sitting in the Tucker Center, shooting the breeze. That’s when some of our best creative moments come up, and those are my favorite things—as a team, when we’re talking together. For folks who don’t think of themselves as “sports people,” what’s the impact of the Tucker Center? 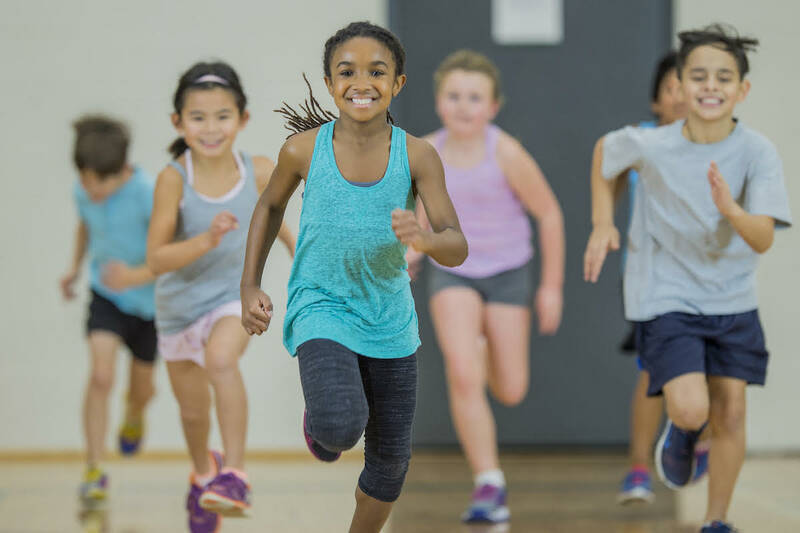 NL: It’s the Tucker Center for Research on Girls & Women in Sport, but a lot of our work has been around girls and physical activity, highlighting the barriers that girls face and working with stakeholders to try and eliminate those barriers. For many stakeholders—parents, coaches, physical educators, sport administrators, people that do physical activity—we have a big impact. MJK: For people who aren’t interested in sports, whether they like it or not, sports is one of the most powerful social, economic, symbolic institutions in this country. It’s ubiquitous. And it has unbelievable impact for good and ill. Even if you don’t care about sports, you’re aware of its impact. And so in that sense, we can say we are dedicated to taking seriously what it means for girls and women to be involved in sports and physical activity, from self-esteem to social identity to how they’re represented in the media. We are certainly the first and, I say humbly, the best center that does work in this area. Gopher women’s basketball coaches Danielle O’Banion, Lindsay Whalen, Pam Borton (2002–14), and Kelly Roysland with Mary Jo Kane and Nicole LaVoi and former athletic director Joel Maturi (2002–12). Photo by Chris Cooper. Gender equality benefits everyone. How would you describe the Tucker Center’s effects on boys and men? MJK: There are few, if any, institutions in this country that boys and men identify with more, respect more, care about more, than sports. Because historically we know that the definition of masculinity and maleness has been equated with what it means to be an athlete. When young men are at Williams Arena for the fifth game of the WNBA championship—to see those women come through the biggest spotlight in the biggest moment under the biggest pressure and have the hearts and minds of champions—it is a highly visible arena in which boys and men can see women succeed in an institution that they have respect for. NL: To break it down even further, the work that we do here that impacts boys and men is the work that Dr. Kane has done with media images and coverage of female athletes. When men see women as competent, powerful, strong female athletes, it changes their perceptions of women in general. Who do you see as the next generation of the Tucker Center, and what will their work be? JS: I often wonder what is the next step. Are we going to expand? What are the new challenges we’re going to come up against? One of the things we’ve talked about is integrating the community more with what we do. We’re small, so it’s not that easy. I think the community will continue to be a strong part. NL: I think the next generation, if we want to grow and extend, is going to be a matter of resources. . . . I think the next generation will extend and complement the work we do here in the Tucker Center. That’s my vision—that we continue to amplify our work through hard-working people that we’ve trained, that are in the community, and people that come after Dr. Kane. MJK: Nicole has taken the Tucker Center far beyond anything I would have thought about or done. Nicole is a fabulous scholar but she’s also deeply committed to being out in the community and building relationships. One of the great things about being in this area is that sports and gender is a motherlode that will never be fully tapped. It’s not like there’s not enough material out there. It’s just getting the resources to mine it. I’m really curious to see where the next ten years will take us. What’s next? What excites you about the future? JS: New ideas. Grad students coming in. NL: What I’m most excited about is using the work that we have and really figuring out ways to get this data in front of decision-makers and those who have the power to make a change. MJK: We have to continue to do really important research and collect data that are reliable and meaningful. Reliable hard data that can change the culture—that is an enormous vehicle for us to have impact around social change. But we have to continue to do the research. NL: People are looking to us from around the world for the work that we do. 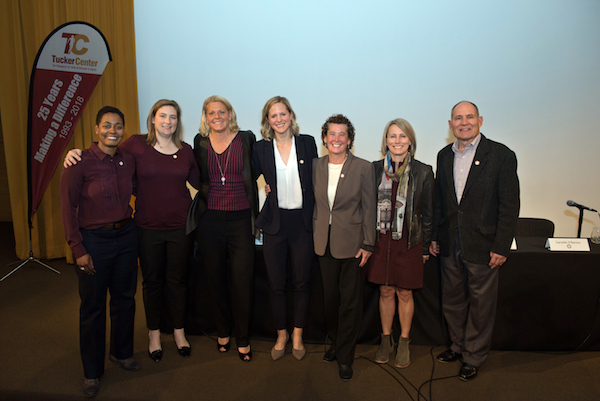 Read about the Tucker Center’s 25th anniversary distinguished lecture on October 16, 2018, featuring the new Gopher women’s basketball coaching staff and former Gopher athletes, Lindsay Whalen, Kelly Roysland, and Danielle O’Banion. 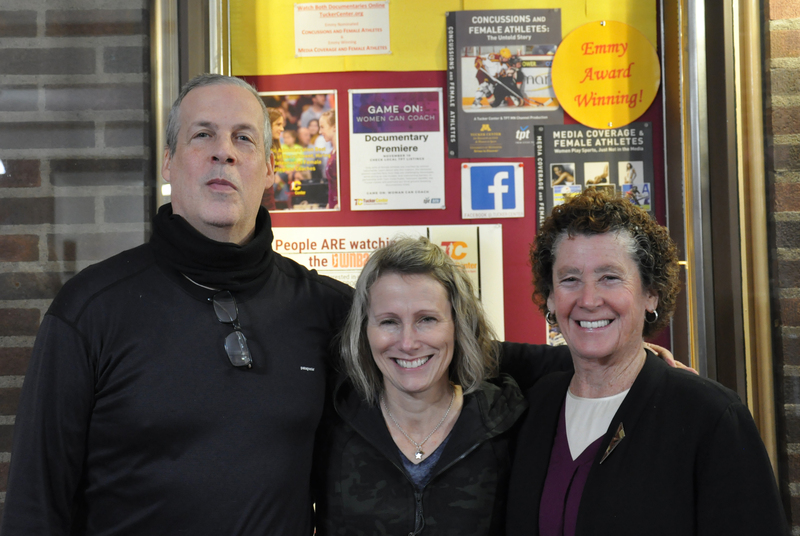 Learn more about the Tucker Center for Research on Girls & Women in Sport.